Why Try a Capsule Wardrobe Challenge? Inspired to make the transition to a greener closet, but not sure how to get started? Try a capsule wardrobe challenge! Capsule wardrobes help you simplify your morning routine, save time and money, allow you to spend more time engaged in the activities you love, all while helping to protect the environment. With those reasons in mind, a handful of passionate bloggers have come up with some clever ways to help you make the transition to a sustainable capsule wardrobe by creating these capsule wardrobe challenges. Wear 1 dress for 365 days. This started as a personal challenge for Sheena Matheiken. Looking for a creative outlet, her goal was to wear the same dress everyday for a year - but make it look unique every single day. She combined this effort to also raise money for the Akanksha Foundation, which send kids to school who otherwise couldn’t afford to go. I love the idea of creating a personal uniform that allows you to spend more brain power on the things that you are truly passionate about. I also loved that she created a personal goal that also served as a fundraiser for others - what a cool idea! The creativity in her outfits were inspiring and I liked that her personal style really shined through. She had 7 identical dresses in her line-up - no one could accuse her of being stinky - and the dress was designed to be worn multiple ways. There were a number of outfits or combinations that were too eccentric for me, and it's hard for me to imagine wearing the same thing every day for a year - even it looks somewhat different. I like variety and the ability to shake things up a bit. I also didn’t love that each outfit has to be 100% new everyday. Repeating outfits or using the same rotation of accessories just makes sense to me, and I like the idea of uniforms because they’re supposed to make getting ready simpler, not more complicated. I feel like this could be a really great option for someone who really loves fashion and likes to use their clothing as more of an expression of their creativity. The dress she wore was designed to be worn forward, backward or unbuttoned. So, it may be difficult to pull off some of the looks with a classic a line dress. Fortunately, they have 3 different styles of LBD's available to be purchased on their site and a pattern so you can sew your own. Check out all 365 outfits. 10 Items for 10 Days. 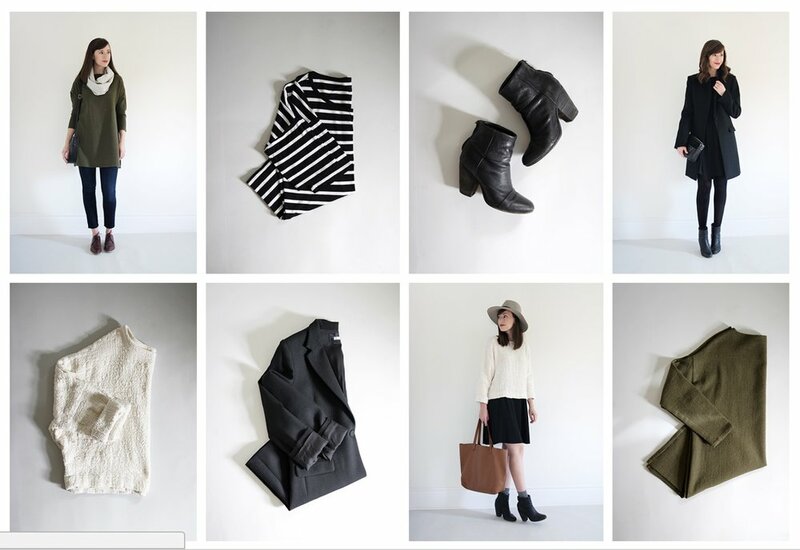 Stylebee is the brainchild of Lee Vosburgh and the founder of the 10x10 challenge. She is an advocate for the considered consumption of clothing and has incredible taste. She reminds me of a modern-day Coco Chanel with her clean lines and simple elegance. The 10x10 challenge or the 20x20 challenge or the 6x6 challenge is a great way to tip-toe into the capsule wardrobe world. By selecting just a few items you'll really start to understand why you like certain pieces and what your personal style really looks like. I think this is also an excellent exercise to go through if you're currently bored with your clothing selection and think that adding a new item will make you feel better about your wardrobe. So often we really just need to shop or re-imagine the items we already have. All you do is choose 10 items of clothing - shoes count, accessories don't. A 10 day challenge seems super manageable. Especially, if you think about it like packing for a 10 day vacation. She also focuses on making the challenge work for your lifestyle. Suggesting that you take the challenge only for work wear, or maybe you choose 12 items for 12 days etcetera. I love that the goal of this capsule wardrobe is to use items that you already own. I hate the idea of having people shop for a whole new (capsule) wardrobe, when they aren't even wearing all the clothing they already own. Capsule wardrobes can help us make the mental shift we need to reduce the environmental impact of fast-fashion andmake for ourselves and the planet. changes we need - so let's use what we have and buy selectively. I also think creating a wardrobe for 10 days is unsustainable for the long haul - at least time wise. You're saving time every morning by reducing the number of decisions you have to make, but once you're living the capsule wardrobe lifestyle, I'd suggest you give the 15x30 challenge or project333 a try. Or maybe make your own perimeters for your ideal capsule wardrobe. Of course we’re going to be a little more biased on this one — mainly, because we came up with it. The goal of this challenge was to help those who wanted to switch to a capsule wardrobe realize just how little clothing they needed in order to look great on a regular basis. We also wanted to highlight that capsule wardrobes can be done across a wide range of styles and body types. Learn more about the 15x30 challenge. The point of this challenge is to be a launching point for people to become more thoughtful about what they’re buying and wearing and inspire them to make changes to their own wardrobe to fit those new understanding. We chose 30 days so it could be included in our Live Well Challenges - and because you can make a behavior a habit if stick with it for 30 days. We don't believe that you'll probably stick with the 15x30 wardrobe for the rest of your life, but we do hope that it helps you buy fewer, better things. We don't include accessories in this challenge, but some people did decide to. I think that limiting the number of accessories is nice, because it focuses you to select the pieces you love the most - and helps to streamline your morning decision making. During the summer, I should have included another pair of jeans and/or shorts. I ended up having to wear a dress while biking - or not biking because I was wearing a dress and that's not great! I also think that this is a great jumping off point for those who are interested in testing out a capsule wardrobe. Courtney Carver from BeMoreWithLess.org, created this challenge as a way to reduce stress in the morning. In this project you change your wardrobe every 3 months, with no shopping in between. You select 33 items and wear only those items for 3 months. Basically, your wardrobe moves with the seasons. Clothing, jewelry, accessories and shoes are all included. So are hats, scarfs, and outer coats. You don't have to include workout clothing or special occasion gear - as long as you aren't wearing those items on a regular basis. The best thing about this particular challenge is you take the time to figure out your wardrobe once and then you don’t have to think about it again for the next 3 months. If you’re looking for something that you can do once and get on with the other things in your life that you'd like to spend more time doing then this is a great option. I also love that she has a huge focus on wearing the things you love everyday - think, does it spark joy? For most folks looking to transition to a sustainable capsule wardrobe - this challenge is a little more daunting because you’re making a commitment for 3 months. If you haven’t invested in pieces that really work well together, or are of higher quality, you may not actually love getting dressed in the morning, or you may have to buy a piece or two so that you actually have a compatible wardrobe. Whereabouts, with most of the other challenges, you can really jump right into it. The other difficulty I found with this challenge is that I can make 33 items work, but it kind of takes the fun out of getting ready for me in the morning. I think it's because I'm supposed to include accessories, coats, scarves etcetera. On the other hand, I kind of want my wardrobe to be paired down in all those categories, but I also don't want to have to store my other clothing somewhere else. I feel like most of my summer clothing should be transferable in the winter by adding tights and a sweater, and sometimes having a non-essential pair of heels or shoes can make an outfit more enjoyable to wear. I think she would agree that the point of the project is to reduce you wardrobe to a number that works well for you and your lifestyle, with the main point being that it works - and you're not just telling yourself it works. Sometimes creating perimeters for ourselves allows us to be more creative in that space. The benefits of simplifying your closet (and your morning routine!) not only will help you reduce the number of decisions you have to make every morning and give you more mental space, but they also reduce the environmental impact of the fashion industry, while saving you time and money. Check out the related blog post below to learn more. Capsule Wardrobe, Ways to Reduce Stress. 4 Reasons to Take the 15x30 Challenge. Here are four reasons to try the 15x30 challenge and be part of the fashion revolution. A few great Christmas Party outfit ideas for those rocking a capsule wardrobe. Declutter, Capsule Wardrobe, Habit Shifts, Popular Posts, Ways to Reduce Stress. How to create a spring and summer capsule collection that actually works. Hint: You probably don't need to buy anything. 5 Best Places to Donate Your Stuff.